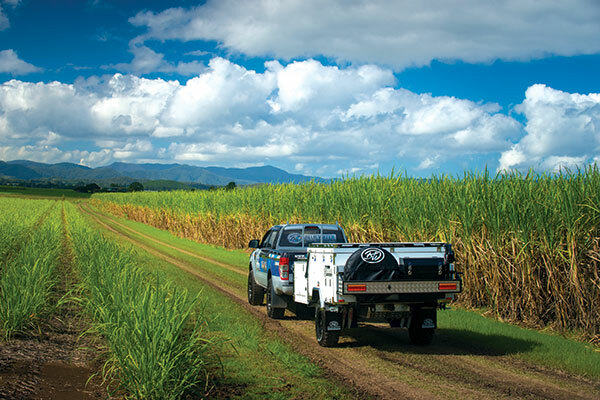 When a camper trailer company has innovation as a key focus, there can only be benefits for those who love to head out on the open road. Bluewater's forward fold offering, the Macquarie, impressed our judges with the myriad of features included in the model on show. From the quality, to the components and the subtle touches that add to ease of living, there was plenty of praise for this camper. 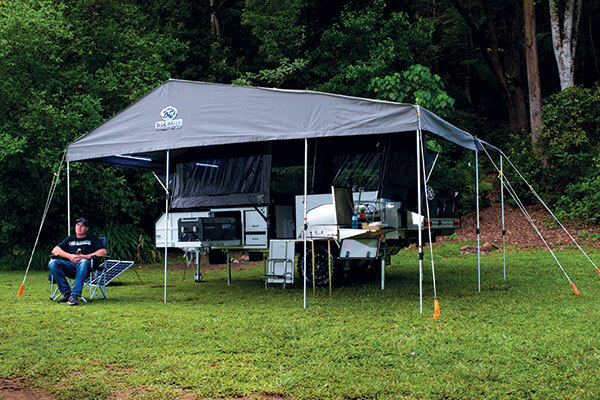 The Bluewater Macquarie is a big camper, in both its physical dimensions and its style. This was among the best of the forward fold designs seen at CTOTY 2018 and sets itself apart by the level of thought obviously given to making this the best possible camper it could be, thanks to clever and innovative ideas and the use of large amounts of quality Australian components throughout. At $32,000 as seen at Mt Warning, it was the second most expensive of the forward folds, but you then have to ask yourself is the added cost worth it. Well you’d be hard put to say no. If a forward fold is within your buying plans then we’d definitely say you should look at this camper. The only trouble with campers with this much attention to detail is that for those who like to value-add on the weekends there isn’t much left to fiddle with. It was big and roomy, an impression enhanced by its large windows, all the way to the top of the tent peak, and for those holidays with the kids by the beach or river the big footprint under canvas – the awning is 6000x2400mm, plus the ensuite and rear wrap-around extension – would make this a comfortable camper to live with. With a Tare of 1500kg it wasn’t out of the ballpark for a forward fold, and its ATM of 2400kg gave it plenty of load capacity. The ball weight of 125kg was surprisingly light. When it comes to comforts and ease of living in the forward fold hard floor space, the Bluewater Macquarie takes the cake. 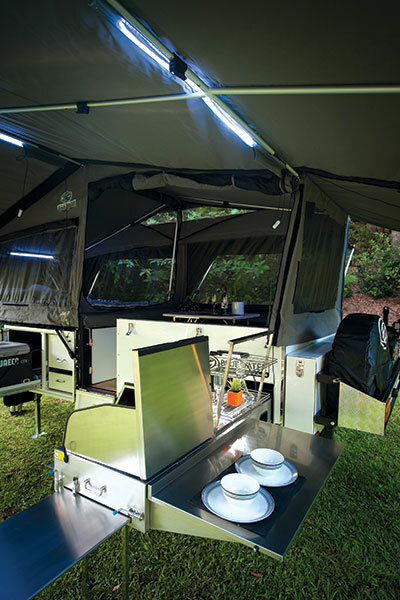 The imported base trailer keeps the cost down, but the fit out is exceptional and exudes Aussie quality. Take the tent, for example, which is top quality Aussie made Dynaproofed 14oz canvas with a three year warranty. You’d expect nothing less from a company whose director made Burke and Wills swags for 30 years, after all. The privacy screen that divides the queen innerspring bed from the U-shaped dinette was the only one at CTOTY that actually sealed completely. This is an important and frustratingly obvious feature on a style of camper designed specifically for an open air interior via the roll-up cafe window at the dinette. In the Macquarie, you can enjoy balmy summer nights dining at the table and know that your sleeping zone will be free from bugs. The window clears at the gables are a nice touch, too, allowing some light in even if you’ve got the place completely closed up in cold weather. In the heat, the spring-loaded tropical roof keeps the air circulating. The other standout on the Macquarie is the kitchen. It offers a huge amount of bench space with a flip-over table and bench extension slide, and the pantry drawers and fridge slide are impressively large. There’s a Dometic three-burner stove and hot water is plumbed to the sink, as well as the shower in the large ensuite with wet/dry zones. In true Aussie form Bluewater took their original model, the Murray, and made it better in the new Macquarie. It evolved from its predecessor by combining all the features and elements that we loved but it added a huge array of innovations and improvements. 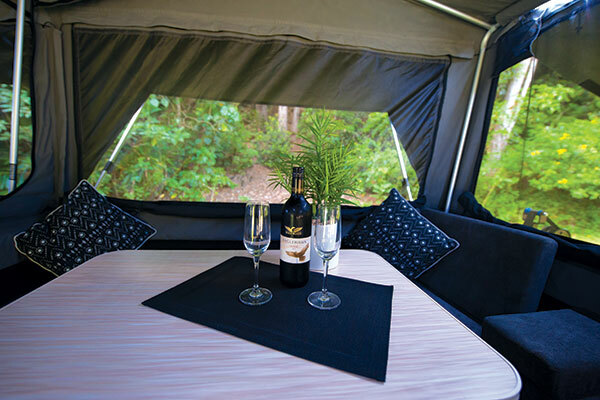 It features a very large main shell, galvanised chassis and swing arm assemblies with premium Australian Wax Converters Dynaproofed tent and awnings, and quality YKK zips and fine mesh screens to keep the bities and creepy crawlies at Bay. The easily erected tent features a “non-adjustable, spring loaded, gas strutted pole system” so it's instantly ready for an overnighter. The Tare weight is 1500kg which reflects the quality, size and facility of the complete package. The GVM has been increased to 2400kg to cater for this large capacity camper with its 160L water tanks, plus the usual camping and recovery gear, clothes, food and drinks. Underneath is a full box section sub-frame with independent trailing arm suspension and locally supplied spring and shock components riding on 16x8in alloy wheels. It’s plenty of weight in extreme offroad conditions but has the integral strength for the load. 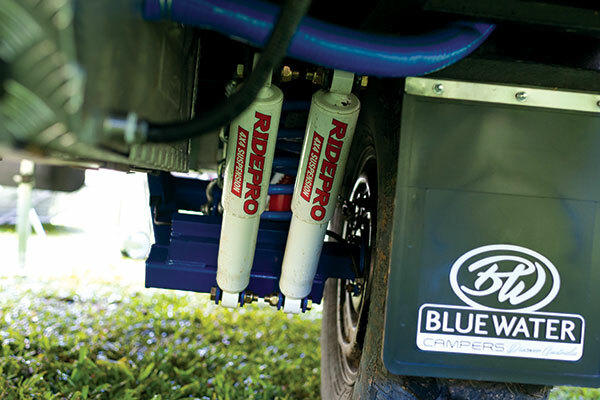 Out in front we find the increasingly popular McHitch 3.5 tonne Uni-glide trailer coupling for genuine offroad flexibility. The undersides have twin rated recovery points with a slide fitting for an optional push bike carrier and there is still a good recovery angle, so the bum of the trailer isn’t dragging in heavy undulations. The water tanks are fully shrouded for protection and fitted with sturdy bungs and fittings. Up top, the roof has its own racking and tie down points for even more load capacity. The Macquarie doesn’t really need a boat loader as the top of the camper has loading and tie down facility that’s ideal for the fishing kayaks, however you would have to lift the vessels off each night to set up camp. There’s some real innovation in the choice of components and features such as the “snake track” convoluted flexible hose retainer that means there is no more assembly of the power and water fittings as you slide out the kitchen. A quick look from the outside of the Bluewater Macquarie may not reveal some of the secrets that lay within. It’s a combination of the little things that make this tough house an offroad home away from home. With a 1500kg Tare, Bluewater have managed to cram a hell of a lot of gear into the Macquarie. Not just in terms of accessories and comfort either, serious stuff that means you can stay bush long after the Joneses have been sent packing with mouldy bread and dry tanks. The immediate drawcard in the Macquarie’s favour is the twin water tanks. Up the back the 130L main tank provides plenty of drinking water for a family of four for up to two weeks, while up front, a second 30L tank provides an additional few days of supplies if you somehow damage the main tank. Redundancy is a damn good thing for remote touring. Bluewater also boasts that their water system is decked out with enough quality gear so it’s able to handle mains water pressure. Plug in a tap at a caravan park and completely bypass your water system. There’s a few goofy handles to make the switch, but a handy feature nonetheless. Comfort levels are bang on for extended stays too. The double ensuite offers wet and dry areas so you’re not trying to change your undies standing in a puddle of water. Power is your standard twin 100Ah batteries, with a 200W solar panel included in the mix. There’s twin 20L jerry cans up front as well as allowance for two 4.5kg gas bottles (plenty for anything short of circumnavigating the globe). Food storage is more than ample too with one of the biggest pantries I’ve ever seen in a forward fold camper.